1) Zandinejad A, Atarodi M, Abdel-Azim T, Leonhart RM, Morton D.Complete oral rehabilitation of a patient with hereditary gingival fibromatosis: A clinical report. J Prosthet Dent. 2014 Sep 29. 2) Abdel-Azim T, Zandinejad A, Elathamna E, Lin WS, Morton D.The influence of digital fabrication options on the accuracy of dental implant-based single units and complete arch frameworks.Int J Oral Maxillofac Implants. 2014 Nov-Dec;29(6):1281-8. 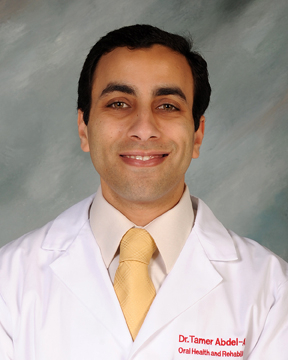 3) X Khan Z, Abdel-Azim T. A direct technique to fabricate an intraoral shield for unilateral head and neck radiation. J Prosthet Dent. 2014 Sep;112(3):689-91. 4) X Metz MJ, Miller CJ, Lin WS, Abdel-Azim T, Zandinejad A, Crim G. Dental student perception and assessment of their clinical knowledge in educating patients about preventive dentistry. Eur J Dent Educ. 2014 Jul 15. 5) X Geminiani A, Abdel-Azim T, Ercoli C, Changyong F, Meirelles L,Massironi D. In Vitro Comparison of the Use of Oscillating vs.Rotating Instruments for Teeth Preparation on Finish Line Surface Roughness. J Prosthet Dent. 2014 Jul;112(1):51-8. 6) X Metz MJ, Abdel-Azim T, Miller CJ, Lin WS, Zandinejad A,Oliveira G, Morton D. Implementation of a Laboratory Quality Assurance Program: The Louisville Experience. J Dent Educ. 2014 Feb;78(2):195-205. 7) X Zandinejad A, Abdel-Azim T, Lin WS, Morton D. Fabrication of a fixed multipurpose template retained by existing dental implants. J Prosthet Dent 2013;110(2):144-6. 8) X Abdel-Azim T, Fantuzzo J, Batalocco G, Cho S, Ercoli C, Morton D. Oral rehabilitation of an edentulous patient using two-segment Le fort I repositioning and implant-supported fixed prostheses. Int J Oral Maxillofac Implants 2013 Mar-Apr;28(2):e106-11.